8:14 There is a vanity that takes place on earth, that there are righteous people who are treated according to the conduct of the wicked, and there are wicked people who are treated according to the conduct of the righteous. I said that this also is vanity. 15 So I commend enjoyment, for there is nothing better for people under the sun than to eat, and drink, and enjoy themselves, for this will go with them in their toil through the days of life that God gives them under the sun. 16 When I applied my mind to know wisdom, and to see the business that is done on earth, how one’s eyes see sleep neither day nor night, 17 then I saw all the work of God, that no one can find out what is happening under the sun. However much they may toil in seeking, they will not find it out; even though those who are wise claim to know, they cannot find it out. 9:1 All this I laid to heart, examining it all, how the righteous and the wise and their deeds are in the hand of God; whether it is love or hate one does not know. Everything that confronts them 2 is vanity, since the same fate comes to all, to the righteous and the wicked, to the good and the evil, to the clean and the unclean, to those who sacrifice and those who do not sacrifice. As are the good, so are the sinners; those who swear are like those who shun an oath. 3 This is an evil in all that happens under the sun, that the same fate comes to everyone. Moreover, the hearts of all are full of evil; madness is in their hearts while they live, and after that they go to the dead. 4 But whoever is joined with all the living has hope, for a living dog is better than a dead lion. 5 The living know that they will die, but the dead know nothing; they have no more reward, and even the memory of them is lost. 6 Their love and their hate and their envy have already perished; never again will they have any share in all that happens under the sun. 7 Go, eat your bread with enjoyment, and drink your wine with a merry heart; for God has long ago approved what you do. 8 Let your garments always be white; do not let oil be lacking on your head. 9 Enjoy life with the wife whom you love, all the days of your vain life that are given you under the sun, because that is your portion in life and in your toil at which you toil under the sun. 10 Whatever your hand finds to do, do with your might; for there is no work or thought or knowledge or wisdom in Sheol, to which you are going. 4:21 Tell me, you who desire to be subject to the law, will you not listen to the law? 22 For it is written that Abraham had two sons, one by a slave woman and the other by a free woman. 23 One, the child of the slave, was born according to the flesh; the other, the child of the free woman, was born through the promise. 24 Now this is an allegory: these women are two covenants. One woman, in fact, is Hagar, from Mount Sinai, bearing children for slavery. 25 Now Hagar is Mount Sinai in Arabia and corresponds to the present Jerusalem, for she is in slavery with her children. 26 But the other woman corresponds to the Jerusalem above; she is free, and she is our mother. 27 For it is written, “Rejoice, you childless one, you who bear no children, burst into song and shout, you who endure no birth pangs; for the children of the desolate woman are more numerous than the children of the one who is married.” 28 Now you, my friends, are children of the promise, like Isaac. 29 But just as at that time the child who was born according to the flesh persecuted the child who was born according to the Spirit, so it is now also. 30 But what does the scripture say? “Drive out the slave and her child; for the child of the slave will not share the inheritance with the child of the free woman.” 31 So then, friends, we are children, not of the slave but of the free woman. 15:29 After Jesus had left that place, he passed along the Sea of Galilee, and he went up the mountain, where he sat down. 30 Great crowds came to him, bringing with them the lame, the maimed, the blind, the mute, and many others. They put them at his feet, and he cured them, 31 so that the crowd was amazed when they saw the mute speaking, the maimed whole, the lame walking, and the blind seeing. And they praised the God of Israel. 32 Then Jesus called his disciples to him and said, “I have compassion for the crowd, because they have been with me now for three days and have nothing to eat; and I do not want to send them away hungry, for they might faint on the way.” 33 The disciples said to him, “Where are we to get enough bread in the desert to feed so great a crowd?” 34 Jesus asked them, “How many loaves have you?” They said, “Seven, and a few small fish.” 35 Then ordering the crowd to sit down on the ground, 36 he took the seven loaves and the fish; and after giving thanks he broke them and gave them to the disciples, and the disciples gave them to the crowds. 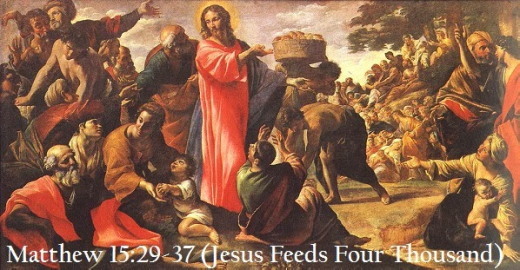 37 And all of them ate and were filled; and they took up the broken pieces left over, seven baskets full. 38 Those who had eaten were four thousand men, besides women and children. 39 After sending away the crowds, he got into the boat and went to the region of Magadan.